A hardwood floor mop is designed specifically to both protect and clean. Gone are the days of mop buckets and sponge heads. You’ll find that cleaning your hardwood floor is efficient and less labor-intensive than other flooring materials. 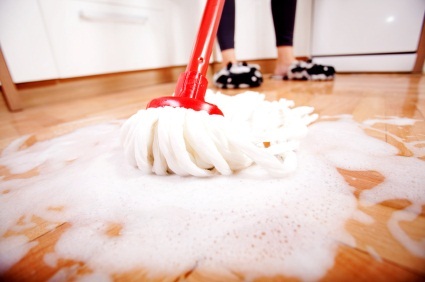 NEVER wet mop or use excessive water to clean your floor. Do not use hardwood floor cleaning machines or steam cleaners. Water damage to hardwood floors is not repairable. Only replacing damaged boards (patching) or a full sand and refinish will restore the floor like new again. Standing water can dull the finish, damage the wood and leave a discoloring residue. Even though the individual boards of your floor are coated with a protective finish, the boards expand and contract depending upon the amount of moisture in the air. This leaves gaps between the boards, no matter how small, where water can seep in. The finish on your floor wears normally over time, leaving bits of bare wood exposed. Wood naturally expands when it is wet and can cause your floor to crack or splinter. The purpose of your mop is to remove set-in stains, dirt and other grime that cannot be picked up with a broom or vacuum, and to give your floor’s finish a fresh shine. Therefore, the majority of your cleaning will be with a broom and/or vacuum, and with a soft towel misted with your hardwood floor cleaner to wipe up dirty or sticky spots, spills and other liquids – as they occur. Rotating or swiveling head that makes cleaning corners, under cabinets and along baseboards simple. Removable, washable terry cloth or microfiber cleaning pads. All hardwood floors should be cleaned regularly. But your primary cleaning concerns are water or liquids that can damage both the wood and its top coat, and dirt or dust particles that can scratch your finish. Sweep, dust mop or vacuum the floors. If vacuuming, use a hard floor attachment to avoid scratching or dulling your floor’s finish. Spray or mist a small section of the floor with hardwood cleaner or slightly dampen the mop head. remove dirt from the mop. Drag the mop side to side, in the opposite direction of the grooves between the floor boards, not with them. Continue moving in sections ensuring no puddles or standing water is left on the floor. Look for a mop with features in ease of cleaning, that will protect rather than harm the surface of your floor, and that allow you to utilize specific hardwood floor cleaners in a way that doesn’t require soaking the floor or leaving standing water. It often comes down to personal preference, so trial and error is well worth the investment until you find the hardwood floor mop that works best for you.